The Perfect Tomato Soup Recipe made from scratch with fire roasted tomatoes and a splash of heavy cream and parmesan cheese. 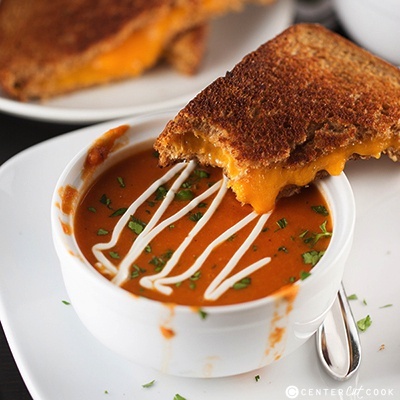 Pairs perfectly with grilled cheese! 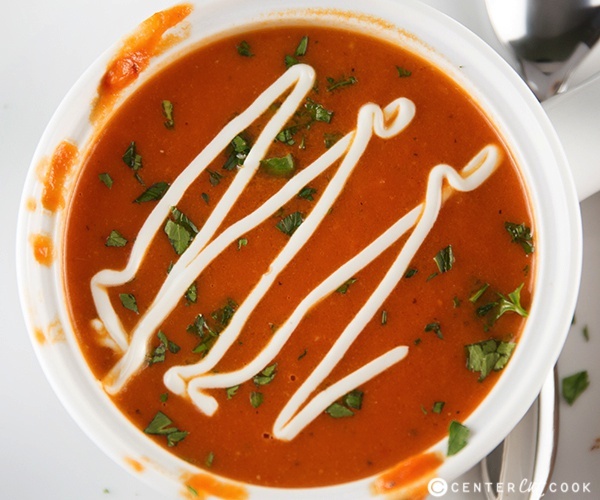 Having a go-to tomato soup recipe is a MUST, especially during cold winter months when the snow keeps coming, and the temperature continues to drop as it has in Chicago all winter long. This is my go-to recipe, the Perfect Tomato soup. I make it with fire roasted tomatoes to give it that smokey depth of flavor. And then I add in a little heavy cream and some parmesan cheese to give it a hint of creaminess that you are going to love. For garnish, a sprinkle of basil completes the soup perfectly. Paired with a toasty grilled cheese sandwich? Heaven! I was first introduced to this soup when Alyssa, The Recipe Critic, made it for us after a morning on the slopes at Deer Valley Resort for Inspire Retreat. 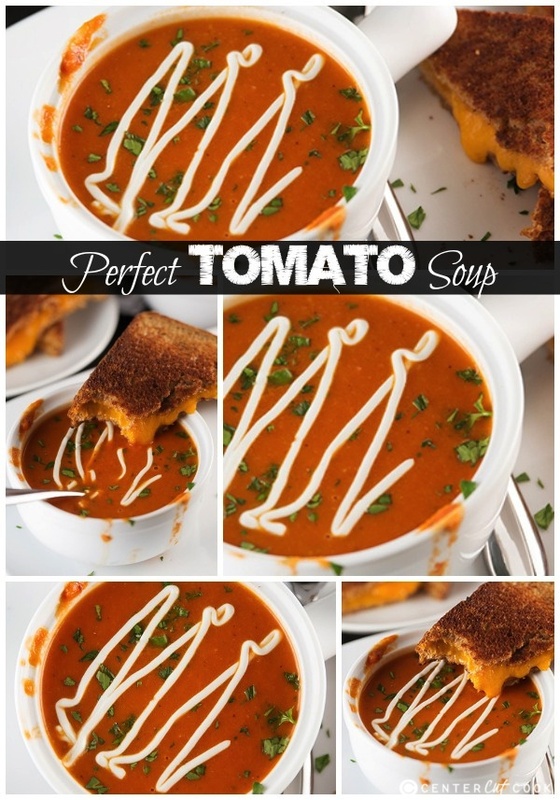 It’s a copycat tomato soup recipe from a restaurant called Paradise Bakery, and while I haven’t tried Paradise’s version to know how it compares, it’s a tasty recipe for sure! One of the last steps in this recipe is to blend the mixture. The best way to do this is with an Immersion Blender if you have one. But, please note that you don’t have to have an immersion blender. I don’t, and I just used my Vitamix blender. Feel free to use any blender that you have to blend it to your desired consistency. I like my soup more on the smooth side, but feel free to make it a little bit chunkier. 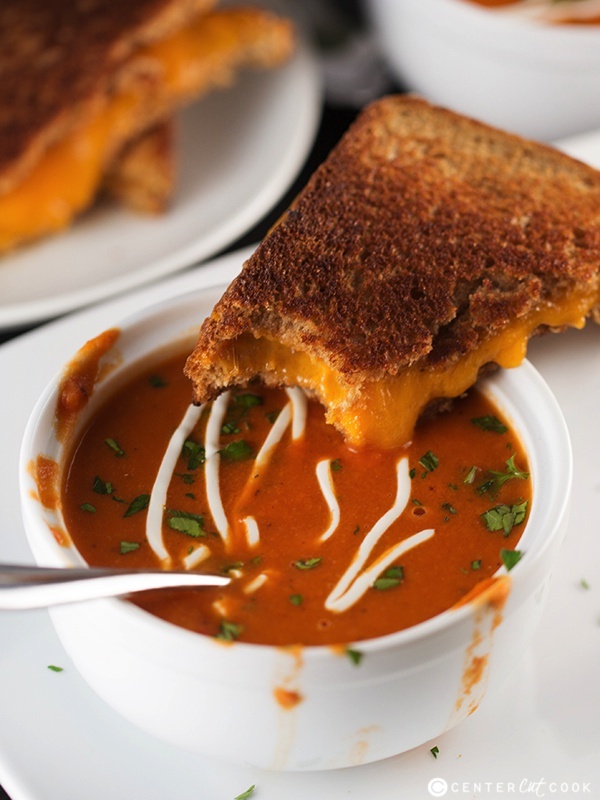 Is there anything better than homemade perfect tomato soup paired with a grilled cheese sandwich? My favorite part about this recipe is the hint of creaminess that comes from a splash of heavy cream and some parmesan cheese. I topped the soup with a sour cream drizzle which is totally optional. Enjoy! In a large soup pot, heat 1 tablespoon olive oil over medium heat. Cook the diced onion until translucent. Add in the garlic and cook for a minute longer. To the pot add in 1 – 28 ounce can whole tomatoes, 1 – 28 ounce can fire roasted diced tomatoes (or 2 – 14 ounce cans), 4 cups chicken broth, 2 teaspoons salt, 1 teaspoon black pepper, and 1/2 teaspoon red pepper flake. Bring the soup to a boil, then cover it and allow the soup to simmer for 30 minutes. Use an immersion blender or a regular blender to blend the soup until you get your desired consistency depending on if you like some tomato chunks in your soup, or if you like your tomato soup more smooth. Add in heavy cream and finely shredded parmesan cheese and cook on low for 5 minutes longer. Sprinkle chopped fresh basil or parsley over the soup for garnish. If desired, make the sour cream drizzle by combining together 1/4 cup sour cream with 1 tablespoon milk. Place the mixture in a ziplock bag, snip the corner, then pipe the sour cream over each bowl of soup.